As a hamster owner, it is understandable that you want to do everything possible to prevent your pet from becoming ill or dying. Vaccinations seem like a logical way to prevent illness, but when you go to your veterinarian for your hamster's first check-up you may be in for a surprise. Hamsters can be vaccinated, but it is not common practice for veterinarians to vaccinate hamsters against diseases. In theory, it is possible to vaccinate hamsters against disease, and some research laboratories have used hamsters for medical testing and research, but vaccinating hamsters is simply not common practice. As of 2013, the Food and Drug Administration does not recognize any vaccinations as being specifically designed for or safe for use on hamsters. The Humane Society of the United States does not recommend vaccinating hamsters. If a situation arises where your veterinarian feels it is necessary to attempt to vaccinate your hamster against a communicable disease, such as rabies, he would have to use a vaccination that is not intended for use on hamsters. Severe side effects can occur when vaccines are used on animals that they are not approved for use on. Hamsters are at low risk for catching communicable diseases because they live indoors in individual cages. Keeping your hamster's cage will do far more towards keeping him healthy than anything else. Your hamster's cage needs to be cleaned daily. Old food and water should be removed and replaced. Soiled bedding should be taken out of the cage and replaced with fresh bedding. Once a week, completely empty the cage of all items and clean it thoroughly with a disinfectant. Keep hamsters separate from one another so they cannot attack and injure one another. Never keep more than one hamster in a cage. Hamsters tend to stay fairly healthy but if your hamster does become ill a trip to the veterinarian is order. A sick hamster may have dry irritated skin, dandruff, hair loss, a runny nose, sunken or dull eyes, diarrhea, seizures or have tumors appear on the skin. An unhealthy hamster will be reluctant to play, irritable, weak and lethargic. Knowing how your hamster normally looks and behaves will help you identify potential health problems early. Some hamster health problems, such as wet tail, can be fatal and will require veterinary intervention in order for your pet to survive. If you suspect your hamster may be ill, you need to quarantine him in another room far away from your other pets. Clean his cage thoroughly, regardless of how recently you may have cleaned it. Provide him with plenty of hard grain food as well as fresh greens and water. Dehydration can quickly turn fatal for a hamster so you need to make sure he stays hydrated, especially if he has diarrhea. A severely dehydrated hamster will need to go to the veterinarian for intravenous fluids. Handle your sick hamster as little as possible and allow him to rest as you can. 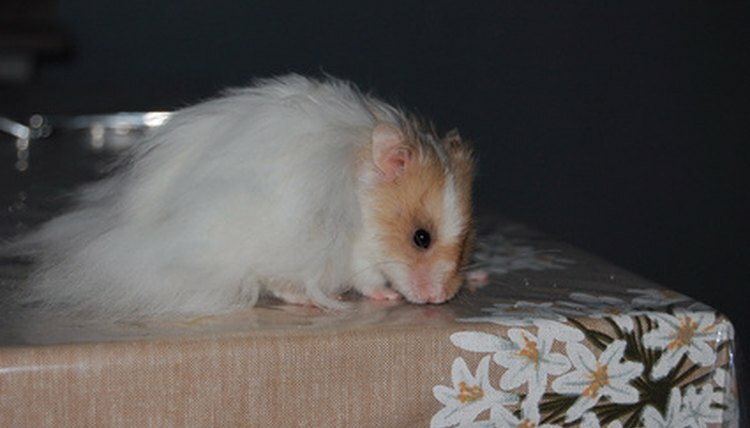 If your hamster is suffering from a disease that can be transmitted to humans, such as mange, you will need to wear gloves and long sleeves when handling your sick pet.